Because I understand loneliness, I believe in the existence of the human soul. I believe that we are engineered with a need for connection. People aren’t meant to be alone. More than just believing that infants need attention, I believe that all of us need family, community, and a circle of friends. Loneliness is the 60 cycle hum of the human soul turned on and running, but not yet connected. It is the screaming over the phone line—waiting for a modem on the other side to respond. There are two basic ways of dealing with loneliness without making friends. One is to suffer. The other is to mask the loneliness with business. We try to be too busy to feel, or we try to numb the feeling. At the moment we have two realities. At this stage in the development of technology there seems to be a lot of engagement that can best be described as isolating. I believe in love letters. Correspondence can develop relationships. The research on social media suggests that social media connections can deepen relationships but have a hard time creating them (see Situated Learning: Legitimate Peripheral Participation by Jean Lave and Etienne Wenger). Here is what I know. Affiliation (and contributions) are trending down. It is as if a guy in a rubber dinosaur suit is crushing a city built of cardboard buildings. Jewish institutions are closing, merging, and downsizing. Jews are staying away in droves. What is easy to witness is the fact that teens are staying away from all youth movements and report that they don’t want cliques (see Current Trends in Jewish Teen Participation with Out-of-School Activities). Show me a teen that doesn’t want to be part of a clique and it is bad news for the Jets and the Sharks. Likewise, boys in particular (who are notorious at being busy playing video games and hacking) are staying away from any Jewish groups. While we are often complaining that Jewish institutions are not investing enough in technology, ironically this is the technology that creates the business that impedes membership. If the Jewish people are going to fight for their future, technology (positive or negative) is not the issue, community (and affiliation) is. We blame the Religious School (and demand that it only be fun) while simply not joining or not attending the synagogue that is the real source of the alienation. It is not only the memory of the synagogue not being fun, of it as a source of boredom, but that as Christopher Lasch in The Culture of Narcissism: American Life in an Age of Diminishing Expectations describes it the new narcissist keeps far away from any involvements that might limit his freedom and mobility. And, yes, I am suggesting that those lost in the reflection of the iPad screen and worship at the idol of the latest and the coolest are narcissists. I want it clear; I am not blaming the technology, though it tends to inflict dopamine addiction, but the context in which it is place. I am not blaming the victims of boredom, though I am saddened by their response. I am concerned about the Jewish community’s and the Jewish educational communities’ response to non-involvement in that they have forgotten that our greatest gift is the ability to end loneliness. Community—not reinforced individuality—is our best sell. We need not go into the ontology of “freedom” here. It is enough to say that belonging and feeling connected does not limit free will. We need to listen through the apparent selfishness and consumerism of the current generations and understand that they are masking their loneliness with a great new business. We should be on Facebook and Twitter. We need apps and websites, and we have to make peace with technology and those who use it. But our strongest sell needs to be, “We can end loneliness.” Our schools are a place of friendships. Our communities are accepting, supportive, and welcoming. Where those things are not true—we must make them true. Ron Wolfson latest hit (after “welcoming”) will be Relational Judaism. He is right and his book will be the next great “The Jewish Book.” It is well deserved. In the same way, Gila Gevirtz’s new Experiencing Sacred Community should be the new standard for Jewish education. To build a shining Jewish future—we need a round table—we need a communal Judaism. Rather than thinking of this moment as a beginning of decline—or even a radical call for innovation (though that is never bad) think of it as a moment where the loneliness and need that will build the future is fermenting. While bells and whistles can mask loneliness, they can never solve it. The need for human contact will give us a future. Skype may be a foreshadowing of teleportation. Texting certainly has replaced the quill. A story about Cuisenaire rods. Cuisenaire rods were a great innovation the teaching of mathematics. These rods are definitely a European thing and probably socialist (as well as experiential math). They were different length colored rods that were used to help numbers make sense. The longest was ten units long and colored orange. The rod that was five units long was colored yellow. Two yellows were as long as an orange. So does a red (2) and a brown (8). It helped students to visualize the way that numbers were built. There was one problem—a lot of pieces to pick up at the end of the lesson. The same narrative functions in Jewish education. Here is an example. About thirty years ago family education was the hottest new technology in Jewish education. It became too successful. Now every synagogue in the country (except for those with a collective AARP membership) is family-oriented and every school actualizes experiences called “Family Education.” Recently, the Consortium for the Jewish Family (a new name is coming) received a grant from the Covenant Foundation to jump-start the movement so that the quality and impact of these experiences can be improved. You can find out about this summer’s family education conference, check out the Jewish Family Education Conference in Detroit. Right now, the latest ‘hot topic’ in Jewish education is experiential education. It has just been adopted as a retro-fit to the entire curriculum of one of the major publishers. Believing in the movement, I am scared that it will go the way of Cuisenaire rods. For the past four years I have been working on creating materials that are specifically designed for experiential education. In other ways, since the founding of Torah Aura Productions we have been creating experiential materials. We are a company founded at camp and rooted in camp. I know that a number of people believe that textbook and experiential are oxymoronic. But, I do not. I believe that education starts with a nugget of understanding or insight that we are trying to enable students to grasp. For the Jewish tradition, these insights are usually locked into texts. And I have always believed (a) that for Jews good text study is experiential and (b) they can be at the heart of powerful Jewish experiences. I have always envisioned my work as experiential, confluent, and a lot of other terms that have grown out John Dewey’s work. We have been shaping our materials to be used in groups, to be short and precise, and to defeat the reading out loud of long passages. While I am anything but an expert, defining experiential education seems useful. First, it is education, so it is connected to planned change. This is not that vicarious learning doesn’t happen in all learning environments, but education is by definition about backwards planning. It starts by defining outcomes and finding ways to hit that target. Second, Experiential Education is active learning. Learning happens when students “do” something. The learning comes from the doing. Third, the deep learning in Experiential Education is in the reflection on learning. It is when they verbalize the experiences they have had. Any book can be used experientially. That is just a question of adaption. But it is possible to create books that specifically create experiential moments. We play by these rules. First we envision the experience(s) that will culminate the lesson or lesson segment. We create the text needed (and only the text needed) to actualize that experience. We figure out an experiential way of digesting that text piece (often a group task). We then segue into the primary learning activity—making sure that reflection on that activity is part of the process. The things to know are that textbooks are not the opposite of positive experience. They can indeed be tools that enable and actualize experiential learning. Materials that are shaped in reading level, focus, and length make their use in active learning easier. Here is the problem. We know that experiential education is a valuable resource for Jewish education. We know that there is a large conversation that involves talking about its application and techniques. We also know that the larger this conversation gets, the greater the chance that experiential education will be trivialized. Success comes with risks of sustainability as “everyone” begins to jump on the bandwagon. New ideas are subject to entropy. What can we do? We can accept the inevitable. We can hold to best practices. And, we can integrate these tools into our on-going skill set. It can join values clarification, inquiry, open classrooms and a whole host of past innovations that no longer have the buzz, but are still integrated (in one way or another) into the way we teach. There is a huge difference between a fad and an innovation that has a natural flow and ebb. Our job at the moment is to create the best practices, the important resources; the serious applications of experiential tools and not worry about the future. Education always winds up being about today’s practices. What we innovate now will become memories and history. Right now, we need to be careful about quality applications of Experiential Education and let the rest take care of itself. 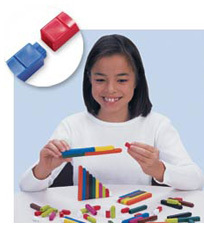 By the way, you can still buy Cuisenaire rods. You are currently browsing the archives for the Experiential Education category.